1x RS-232 thermocouple module, specifically the DGH D5331. 1x TS-7500 single board computer with TS-752 and enclosure. 1x USB thumbdrive for storage. 1x DB9 male to RJ45 female adapter. 1x web server (desktop, virtual machine or cloud-based). 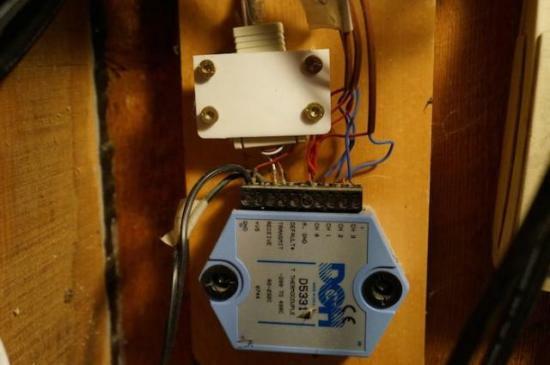 If you're interested in doing something like this, I'd look into using any temperature sensor that uses the DS18B20 IC (or something like it) and use the TS-1700 temperature sensor module with modbus and TS-7680 single board computer. You'd save some money and double the number of temperature sensors you could use. Overall, image below shows what we're looking to build. Four temperature sensors connected to a thermocouple module that is read using a single board computer acting as an SFTP file server. A web server in a different location is able to access the file server to store temperature data in its own database and present a nice-looking dashboard to an end user. 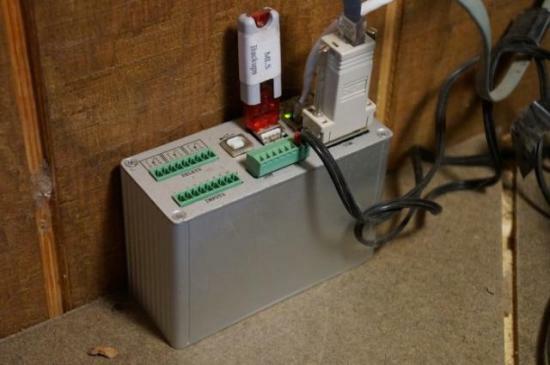 This project guide is going to skim over the hardware setup, highlight a Python script that reads temperature data over RS-232 and spend some time on setting up an HTML dashboard using Google Charts. Hopefully it'll inspire your next project. One of the first considerations was where the temperature sensors should be located in order to provide the most valuable data. In our case, which is in a remote cabin, we wanted to monitor both the inside and outside temperature as well as under the floor where the pipes are located and the coldest bathroom. Once the temperature probes were installed in those key locations, wires were run into a closet where the RS-232 thermocouple module and TS-7500 is housed. The wiring here was pretty straightforward, especially when consulting the manuals, so there's not a lot of value in going into detail here. We used some RJ45 wire and jacks to make things as clean as possible and hooked our thermocouple module to the TS-7500's RS-232 port using the DB9 to RJ45 adapter. Another consideration you might want to keep in mind is power and internet connection reliability. This project was set up in a remote area that is more or less off the grid and very prone to power and internet outages. So, we hooked everything up to a battery backup. Not only that, but given the nature of Linux and power outages, we also set up the TS-7500 to boot from a read-only filesystem (after setting up our software). That's why we're using the USB thumbdrive to store our periodically collected temperature data. We could technically just poll for temperatures when we want them and then store them directly into our website database, but then we might miss collecting that historical data. A final consideration is to make sure to set up port forwarding on our router for SSH (port 22) and then use a service like dyndns.org to make it easy to access this server from the outside world. command = "/usr/local/sbin/xuartctl --port 0 --server --speed 300"
print "Getting serial port to use..."
print "Setting up serial port..."
print "Going to write the following to /mnt/usb/cabin_temps.csv: "
Okay, great. With the script written and working, you easily can schedule it to run every hour as a cronjob. Before you configure the system to boot from a read-only filesystem (if you chose to), make sure you have SSH set up correctly and that you're using a static IP address. This will be necessary for you to collect the data from your web dashboard server. Otherwise, that takes care of this server (we call it the temperature server). You can confidently leave and lock the closet door if needs be. The TS-7500 is rated to operate between 0°C (32°F) and 70°C (158°F), but has been tested to withstand temperatures down to –40°C (–40°F). This particular project has been installed and operating since 2011 and has successfully withstood the harsh Montana winters, with lowest recorded outside temperature reaching –40°F (the highest temperature recorded is 95°F, for those who are curious). The next part of the project puzzle is getting a web server set up that will collect the data from the temperature server, store it and display it in a nice dashboard. For this step, you'll need to set up a web server. For our sake, with unreliable power and connections in a remote area (not to mention dial-up-like internet speeds), we chose to set up a server at a different, more reliable location. Technically, you could run a webserver right from the TS-7500 and have an all-in-one, low power, simpler solution. You'll need to decide which path to take, but for this project, we used a separate server. As long as the server has the ability to write to a datastore/database and run a scheduled job, you can use anything you'd like, be it a physical dedicated box, a virtual machine, shared host or cloud solution. The general steps are to download data regularly (scheduled cronjob) from the temperature server using a script and SSH, store that data into a MySQL database, use a PHP script to read that data, parse and massage it into JSON format for the Google Charts API to understand and finally display it on the web page. Admittedly, there is a lot to this step. As a reminder to keep the incentive going, the reason we're doing all of this is to be able to better prepare for the quickly upcoming cold months given historical data. For us, it answers the question of "when do we need to start worrying about winterizing?" For you, it might be something different, in which case you can adjust as necessary. The image below shows the dashboard we're striving for. print "Finished downloading the file. Getting ready to parse it.\n"
print "Downloading and importing csv file to DB..."
print "Getting ready to insert all temps...\n"
$all_temps_value = "[new Date ( $temp_all_time ), " . $line['t_out'] . ", undefined, undefined, " . $line['t_in'] . ", " . $line['box'] . ", " . $line['lbath'] . Hopefully, this has helped you gain a basic understanding of the different code parts that make up the web dashboard. Again, we have a script to download the raw data and store it into a database, and we have a web page that will read from the database and display it in a human-friendly way. This was the final piece in completing our project. This project was an interesting and rewarding learning experience. We were able to come up with a robust solution that makes planning and monitoring a home easy and meaningful. The ability to view current conditions of your home (or cabin, in this case) from anywhere in the world is incredibly convenient and helpful for planning so your pipes don't burst. It's also handy in situations where high temperatures are a concern, like for pets or livestock in kennels or barns. Naturally, there's more than one way to do this, some easier than others. 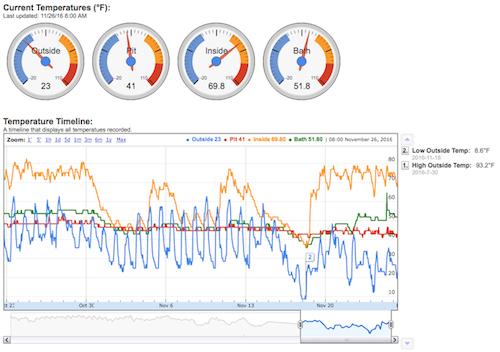 For example, if I were to do it again, I'd use more AJAX calls for real-time temperature polling instead of scheduled. I'd encourage you to come up with your own solution that meets your requirements and suits your particular situation using what you've learned from this project and then build upon it. This has potential in both personal and industrial business applications, such as home automation, so feel inspired and start building! If you have any questions or comments about the project, or if you have ideas to improve it, please be sure to use the comment form below.